Get a cool full screen Caller ID, dialer screen as similar to OS9 in Phone 6, Phone X and Phone 6S, now in your android smart phones. Download HD Phone 6 Call Screen OS9 app and enjoy the icall screen and Phone 6S calling features like on Phone X..!! Receive and give a call in a similar manner you do in an Phone X. 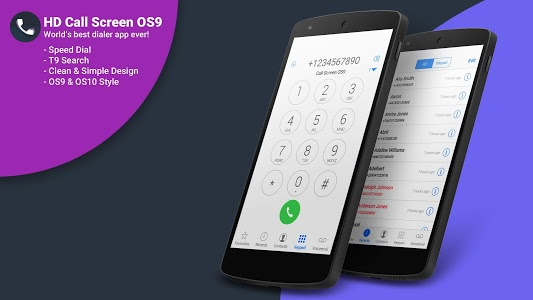 • Use OS9 Phone 6 and Phone 6S call screen theme on your android phone. • Very small in Size just 7.0 MB. • Replace the old calling screen with the True HD pictures of our icall app. • Customize the theme as it suits you. • Full Screen Caller ID and T9 Dialer. • International Number Format available. • Very easy to understand user interface. • Select image of your choice for the background. • Compatible with all android phones. The application is very easy to use and customize the theme as per your requirements and comfort. As you complete installation of the application open it and you will be able see a very user friendly application. Soon after the completion of the installation the default OS9 theme for call screen and caller ID is set ready for use. You can check it by giving a call from other phone to yours. Are you set to customize the icallscreen theme for your android smart phone in just a few simple steps..? The first option ‘Show Incoming screen’ lets you activate the Phone 6 Call Screen theme for all the incoming calls. The second option ‘Show Outgoing Screen’ lets you activate the Phone 6S Call screen dialer theme as and when you call someone from your android phone. The next part is about customizing the Call Screen. 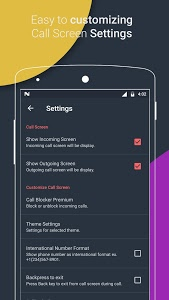 The first option is Theme Setting where in you get various options to customize the theme like changing the background, the sliders to receive or reject a call. By activating the option ‘International Number Format’ you will get the Caller ID starting with the country code like +91 for India +1 for USA, etc. This makes it simple to recognize the country of the person calling you. 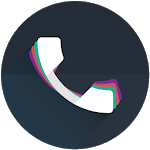 The next option ‘Breakpress to exit’ will let you allow to get back to your original Android theme by pressing the back key while a call is going on. On the main Screen is “Theme Settings”, here you can customize the OS9 theme for the Call Screen, Caller ID and Phone 6S dialer theme. The first option is ‘Change Background’. Here you can customize your incoming and outgoing call screen background in the Phone 6 & 7 theme. The application provides you a lot of cool backgrounds. You can select a picture from your gallery as well..!! The next option is ‘Animation’, you can change the ‘enter and exit’ animation for the call screen. Once you enter the Animation part you get options like: None, Fade In, Zoom In, Slide Right, Slide Up. This enhances the cool looks of your android phone with this Full Screen Caller ID in OS9 theme! When you select 'Full Screen' option it hides the status bar of your phone while using our dialer as well as call screen OS10. The third option on the main Screen of this Phone 6S dialer theme app is 'Themes'. The default theme in this app is similar to the OS9 theme. 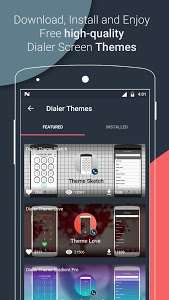 If you wish to get more cool themes for you smart phone then you can download the featured themes compatible with our application. Want to give us any feedback, feel free to reach us any time by “Feedback” option. So what are you waiting for..?? 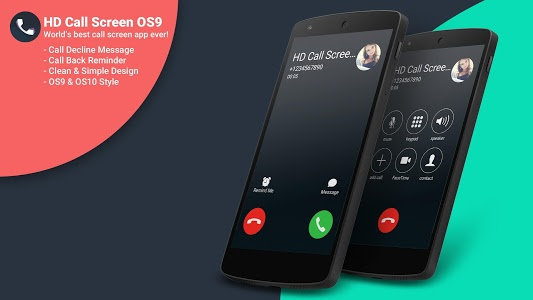 Download this cool Full Screen Caller ID app to use the OS9, Phone 6 & 7 , Phone 6S themes on your android phones and make your friends go crazy seeing Phone 6S Call Screen on your Android! Do not forget to suggest this cool icallscreen app to your friends..!! - Add Support For Android O. 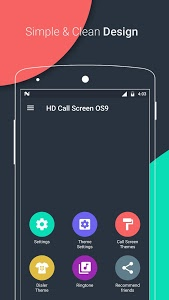 Similar to "HD Phone 6 i Call Screen OS9"